Also serving communities of Sparta, Gainesboro. The average cost of assisted living in Cookeville is $2,513 per month. This is lower than the national median of $3,346. To help you with your search, browse the 12 reviews below for assisted living facilities in Cookeville. On average, consumers rate assisted living in Cookeville 4.3 out of 5 stars. Better rated regions include Mc Minnville with an average rating of 5.0 out of 5 stars. Caring.com has helped thousands of families find high-quality senior care. To speak with one of our Family Advisors about assisted living options and costs in Cookeville, call (855) 863-8283. Tucked in the upper Cumberland area of Tennessee, Cookeville offers a quaint town square for seniors to shop, minimal traffic and a laid-back atmosphere, which makes the city a quiet place to retire. For retirees settling in the area, Cookeville has three assisted living facilities within the city limits and two close by in Sparta and Gainesboro. Licensed by the Tennessee Department of Health, assisted living facilities in Cookeville and within the state provide room and board and standard nursing care, including medication administration. The Cookeville area is home to world-class medical facilities, including the Cookeville Regional Medical Center, in the event of medical emergencies and illness. Cookeville has an array of community resources for seniors, including the Upper Cumberland Development District Area Agency on Aging, an organization that provides information and assistance for older adults, as well as two senior centers. The Upper Cumberland Human Resource Agency offers a Public Transit System for the elderly, handicapped and economically disadvantaged at free or discount fares. The system has both fixed routes and a demand-response service for medical appointments, grocery shopping and other errands. The overall crime rate in Cookeville is 70 percent higher than the national average, which is a concern for seniors living in the area. Residents have a one in 21 chance of becoming a victim of any type of crime. Seniors can save more of their money living in Cookeville due to the cost of living rating of 89.4. This is lower than the national average of 100 and lower than the state average of 96. Seniors can take advantage of the long and hot summers, with July highs around 87 degrees. Winters are short, with lows in January around 26 and an average of eight inches of snow per year. Assisted Living costs in Cookeville start around $2,513 per month on average, while the nationwide average cost of assisted living is $4,000 per month, according to the latest figures from Genworth’s Cost of Care Survey. It’s important to note that assisted living rates in Cookeville and the surrounding suburbs can vary widely based on factors such as location, the level of care needed, apartment size and the types of amenities offered at each community. 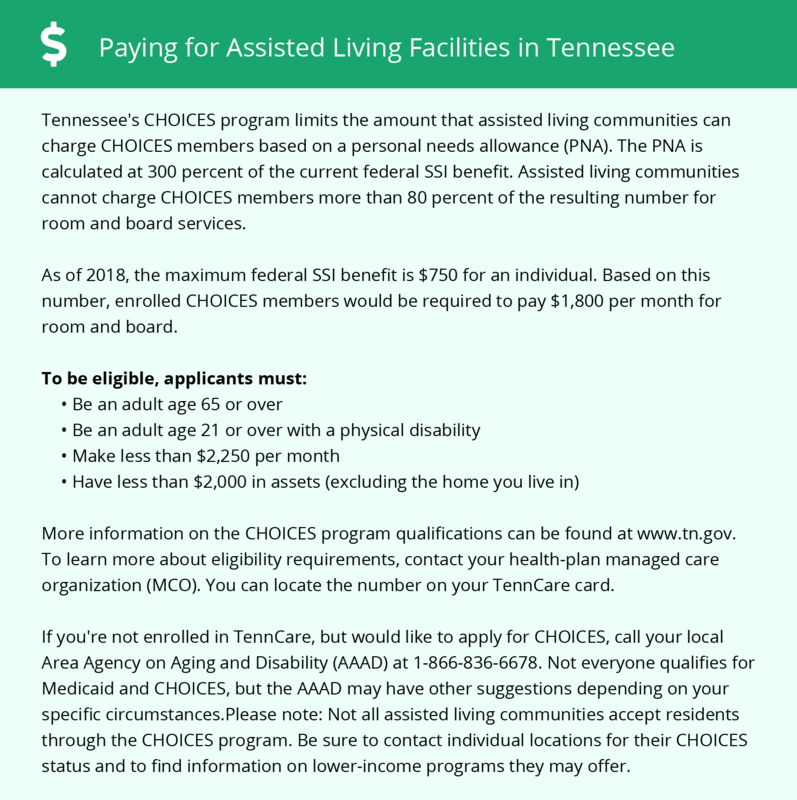 Public financing is available to eligible seniors in Cookeville for an assisted living facility through the states’ managed Long-Term Services and Supports CHOICES program. The program provides a personal needs allowance of 300 percent of the Federal Supplemental Security Income (SSI) rate. Family supplementation is permitted to help pay for a private room. Cookeville and the surrounding area are home to numerous government agencies and non-profit organizations offering help for seniors searching for or currently residing in an assisted living community. These organizations can also provide assistance in a number of other eldercare services such as geriatric care management, elder law advice, estate planning, finding home care and health and wellness programs. To see a list of free assisted living resources in Cookeville, please visit our Assisted Living in Tennessee page. Cookeville-area assisted living communities must adhere to the comprehensive set of state laws and regulations that all assisted living communities in Tennessee are required to follow. Visit our Assisted Living in Tennessee page for more information about these laws.